As OneWeb ships its first satellites for launch next month, the company is now embarking on a media campaign to raise its profile after years of silence. Part of its efforts are to raise its public profile as it raises more capital to complete its planned 650 (down from 900 plus) satellite low earth orbit (LEO) broadband constellation, as well as to start the process of securing customers. 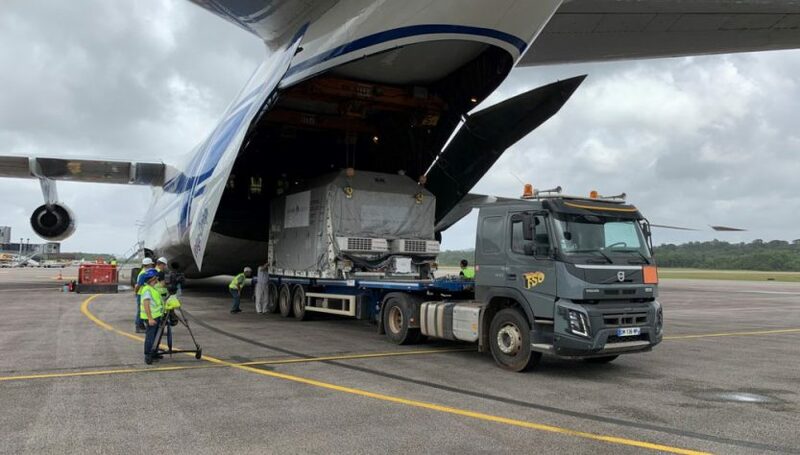 The first six OneWeb satellites, built in France, are scheduled to be launched from French Guiana on an Arianespace Soyuz on February 19, with another four satellites held in reserve on the ground. Initially OneWeb had planned to put 10 French-built satellites into orbit last year, but several factors have come into play to change the company’s plans. Company officials have stressed OneWeb is getting better performance from its satellites than expected, enabling them to launch fewer satellites. But the satellites are also costing more than expected, depending on which analyst and previous OneWeb statements are talking. Targeted cost per satellite was in the range of $500,000 with current build costs estimated at over 1 million dollars per spacecraft. Regardless of the cost per satellite, OneWeb needs to raise more money to continue to build and launch satellites to reach its (current) 650 satellite constellation. Initial funding from SoftBank, Virgin, and others amounting to $2 billion has been spent. Another round in the hundreds of millions of dollars is expected to close soon, with SoftBank and others contributing to the effort. New OneWeb satellites will come out of a purpose-built factory in Florida with a potential to crank out up to three satellites per day, part of the initial $2 billion spend. And the capacity will be needed since OneWeb plans to put over 30 satellites at a time into orbit starting later in 2019, with customer demonstrations starting in 2020 and full global twenty-four hour service available beginning in 2021. Adding customers over the next two years will be OneWeb’s most necessary task. While the company continues to promote the ideal it will be able to provide internet to “everyone, everywhere,” such as providing connectivity for schools that can’t otherwise secure connectivity, OneWeb will need steady streams of revenue from business customers in order to pay the bills and continue to grow. Cellular providers, first responders, and government agencies are likely to be among the usual suspects for initial efforts and wins. OneWeb will also face competition in the years ahead. SpaceX’s Starlink and Telesat are working on building low-latency gigabit-speed services while LeoSat is focusing its efforts on the enterprise sector and up to 10 Gbps broadband offerings.